Don’t let just anyone work on your vehicle’s air conditioning system. 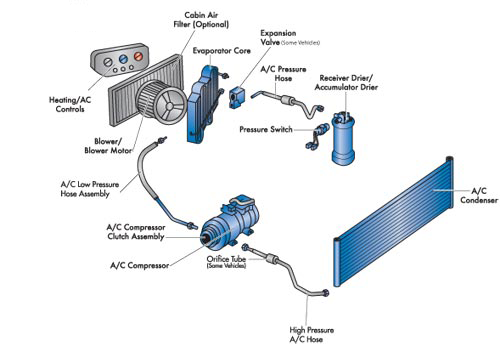 Your vehicle’s air conditioning system is a complex array of pumps, hoses, valves, and other components that are setup differently in every model, as illustrated below. At Midas, we have certified technicians equipped with the industries best diagnostic tools to provide you with fast and efficient service. (Incorrect refrigerant is a leading cause in A/C problems). Complete visual inspection of all A/C components. All of these services allow us to quickly diagnose and properly repair your vehicle’s heating or cooling problems and get you back on the road faster. To help avoid an A/C meltdown, as well as other problems, you should regularly have your Cabin Air Filter and A/C Refrigerant inspected and maintained. We also recommend having our Multi-Point Diagnostic Inspection performed once a year, even if your vehicle is not experiencing air conditioning problems.